Light Up Fun Spinner with FULL COLOR imprint. As low as $2.99 each. Brighten up your next event with this Light Up Fun Spinner. 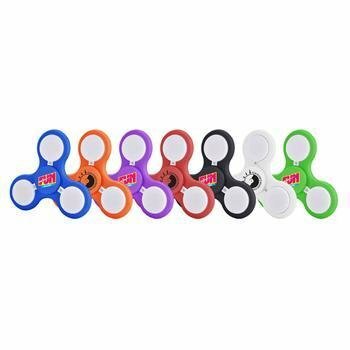 Hold fun in the palm of your hand with the help of this colorful spinner. Focus all of your deep thoughts while self soothing. Great for Anxiety, Focusing, ADHD, Autism, and Insomnia, as well as stress and boredom. Also bring out your inner genius and increase your concentration levels. Small, simple to carry, but most of all FUN, this spinner is ideal for any giveaway. Our Ultra Fast Bearings and bright colors make for a super fun promo. Fun for everyone age 5 and above. Why buy Fun Spinners for your next giveaway?